MY BALL- Husky freshman forward Jennifer Chavarria (left) battles for possession of the ball against sophomore midfielder Jennifer Lopez in East Los Angeles College’s 5-0 away win against Compton College on Friday. The Huskies sit second to last in the South Coast Conference-North and have an overall record of 5-5-3. The duo of freshman forwards Crystal Gonzalez and Perla Navarro were the difference makers for the Huskies. Gonzalez scored twice and gave an assist to Navarro, while Navarro scored twice. Both of Gonzalez’s goals came from the outside of the penalty box. The first goal came two minutes into the game. Gonzalez won possession of the ball on the right side of the field and smashed the ball to the opposite side of Compton sophomore goalkeeper Rosalyn Ascencios’ position to score the first goal. Her second goal came 20 minutes into the second half. Gonzalez ran with the ball from the middle of the field to the outside of the penalty box. Since nobody marked her, Gonzalez took advantage of it and shot the ball to the bottom right corner and extend the Huskies lead to 4-0. “We have a really good connection. She (Navarro) knows when I’m going to send it and she takes off. Most of the time I give her the ball exactly where she needs to be to score,” said Gonzalez. Navarro scored her first goal 10 minutes into the game from outside the box as well. She had possession of the ball on the left side of the field and cut in the middle to get enough space to shoot the ball and score the second goal of the game. Four minutes into the second half, Gonzalez had the ball in the midfield and gave an over-the-head through pass to Navarro. She had a one-on-one against Ascencio and scored to extend the Huskies lead to 3-0. “They’ve been a dynamic duo for the last four games. Crystal is someone who can put in an impossible pass and Perla has the speed and tenacity to run on to it. She’s a finisher, so she doesn’t miss very much,” said Head Coach Tessa Troglia. Navarro is second place in the SCC-North for most goals with nine, and has 12 goals overall. Seven out of ELAC’s last 12 goals have been scored by Navarro, including two hat tricks and two braces (when a player scores two goals in a game). Gonzalez is tied with three other players from the same conference in assists, with five. 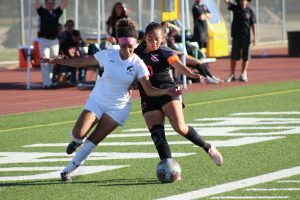 ELAC’s fifth goal came from a pass made by freshman defender Jasmine Casarez, who found the space to center the ball to freshman midfielder Kayla Prado so she could easily shoot the ball in. “It was the difference of finishing our opportunities and taking the opportunities that they gave us. They gave us a lot of space, about 30 yards out, and we had a lot of shots outside the box,” said Troglia. The Huskies look to continue their winning streak as they visit Rio Hondo College on Friday at 6 p.m. in a SCC-North match.